Today, there are over 180,000 Small and Medium Enterprises (SMEs) in Singapore. Together, they employ almost 70-percent of the workforce and contribute to nearly half of the country’s gross domestic product. SPRING Singapore takes pride in supporting these firms and journeying with them through the challenges and successes. Through various sources of help available, SMEs are able to scale-up and grow through upgrading their capability and forging collaborations with likeminded partners. Neha Gandhi, recipient of the SPRING Executive Development Scholarship (EDS), shares her experience with the organisation and how she takes on her role in helping businesses pave the way to success. 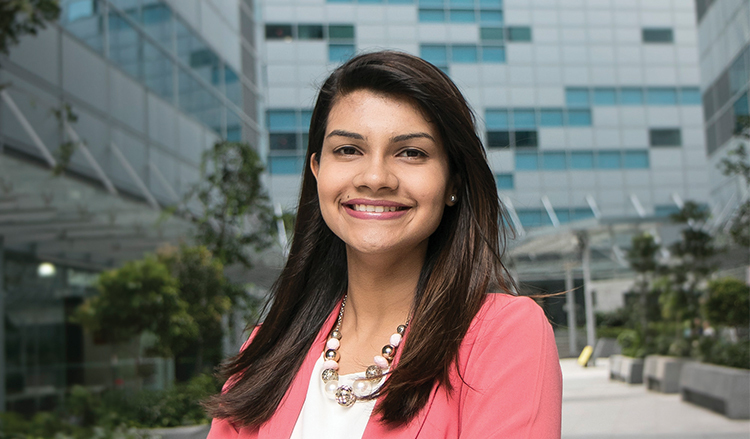 Today, Neha is a manager at SPRING Singapore’s Enterprise Services and Partnership Team. Her primary goal is to identify potential obstacles which may impede SME’s success, and to develop the necessary solutions to help overcome those hurdles. Part of her job entails structuring and nurturing partnerships with multiple parties, which include SMEs, trade associations and chambers, centres for innovation and financial institutions. Neha believes the EDS scholarship was crucial in equipping her with the skills needed to transit from student to working life. During her undergraduate days, she interned with SPRING Singapore’s Quality and Excellence Group, in one of the teams that look into the Business and Service Excellence. Its aim is to help organisations improve their performance based on internationally benchmarked framework and to raise service standards. Under the scholarship, Neha also spent a semester at Maastricht University’s School of Business and Economics in the Netherlands. It was truly a unique experience for her as unlike the seminar styled education in Singapore, the university adopted student-led approach instead. Each week, classes would be conducted not by teachers, but by a group of students – with facilitators on hand to assist when needed. Neha is a member of the yoga and running interest groups in SPRING. Additionally, she is also a member of the SPRINGCares Green committee, she helps the company organise nature walks, recycling and up-cycling initiatives as well as quizzes for its entire staff. Mid-Term Scholar, Aaron Wong tell us more about his remarkable experience as a part of Changi Airport Group (CAG).